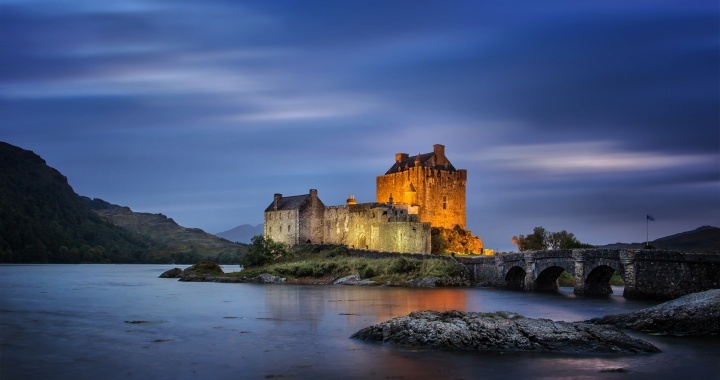 Eilean Donan is one of the most photographed locations in Scotland and as it is located right on the main A87 road north, it is very easy of access, which also makes it very popuar. The castle is situated at Dornie, about 8 miles from Kyle of Lochalsh and is located on its own small island at the junction of three sea lochs – Loch Duich, Loch Long and the outer sea loch, Loch Alsh. There has been a castle on this site since the 13th Century when it was established to protect the area against the Vikings. The castle stood until 1719, when it was involved in a Jacobite rebellion when a party of Spanish soldiers landed in Scotland in support of James the Old Pretender. In the subsequent military action, the castle was captured and destroyed to prevent it from ever being used again as a Jacobite base. The current castle is a reconstruction, built between 1912 and 1922 by Lt Col John MacRae-Gilstrap, and it was only with this reconstruction that the iconic bridge was added. Today the castle is owned by the National Trust for Scotland. For photographers, there are three locations that give fine views of the castle. Firstly from the car park, looking out towards the island of Skye. In the evening this gives views of the sun setting behind the castle, but as it can then appear in sillhoette, it is a challenge for exposures. The second location is at a car park over the bridge at Dornie, in front of a cafe. From here there is a view of the castle backed by the mountains of Glen Shiel. The third location is less well know, and is from the old road that rises 300ft above the A87, giving views over the castle out to Skye. This is a single track road that is most easily accessed by turning into Dornie just before crossing the bridge and then turning first right. There is a parking place where there is a gap in the trees with a view over the castle. Continuing along this road to its highest point gives access to a viewpoint with superb views over Loch Duich, however the best view is a from a small hill to the right of the road, and although it is only a few yards walk, the ground can be boggy, so boots are advised. Eilean Donan is an excellent location for sunrise/sunset shots, and any of the three locations mentioned could be used. When we visited the car park for the evening shots below, there were about 20 other photographers set up with tripods, highlighting the popularity of this location. Eilean Donan is located about midway between Shiel Bridge and Kyle of Lochalsh, and as it is right beside the A87, it cannot be missed. As indicated above, there is a large car park at the castle, another car park first right over the bridge at Dornie, and a parking space on the single track old road above the castle. Our pictures below include views from all three locations, as well as the view of Loch Duich from the viewpoint mentioned above. Posted in Scotland and tagged Coast, Historical. Stunning pictures. The scenery is amazing.